SunRice chair Laurie Arthur and chief executive officer Rob Gordon at the Australian Securities Exchange. 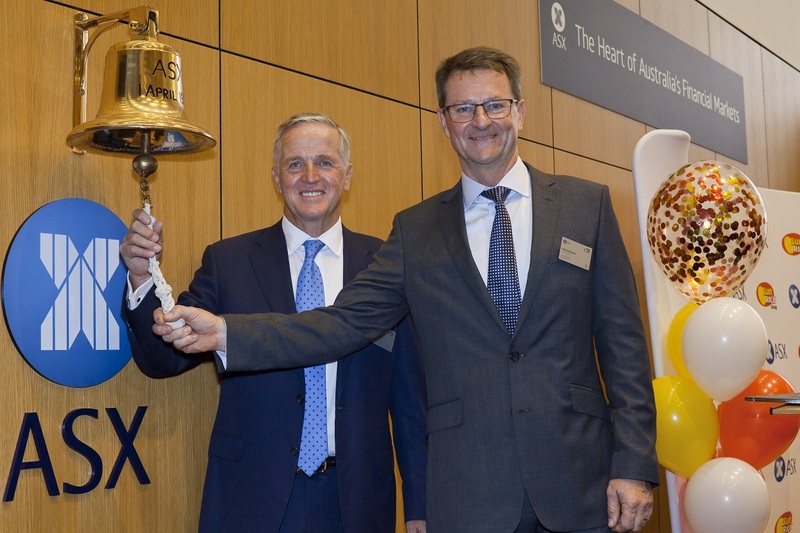 AUSTRALIAN branded foods company SunRice has today taken the next step on a journey that began in the New South Wales Riverina almost 70 years ago, with the company listing on the Australian Securities Exchange (ASX). SunRice’s ASX ticker code will be SGL. SunRice chair Laurie Arthur said listing on the ASX would enable SunRice to have better access to funding, when it was required, to deliver on the company’s 2022 Growth Strategy; a five-year roadmap that capitalises on global food trends and the business’ competitive advantages, with the aim of increasing paddy prices for rice growers and driving shareholder value. “From our foundations as a rice processor and marketer, today SunRice is a $1 billion Australian icon and one of the largest branded rice companies in the world,” he said. “We have a diverse portfolio of businesses and strong track record in innovation and commercialising value-added rice products in high-growth global markets. SunRice chief executive officer Rob Gordon said the Growth Strategy focused on reducing business risk and building resilience. “That is especially important for agricultural companies like SunRice that are exposed to cyclical conditions, such as those currently being experienced in the Riverina by our growers and employees,” he said. How long to a foreign takeover offer?